In early June 2014, the acquisitions committee of Atlanta's High Museum accepted curator Michael Rook's recommendation that the museum acquire a painting by Eric Mack for the permanent collection. 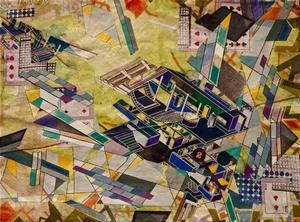 In announcing the acquisition of Mack's SRFC-91, Rooks said: "I recommended Eric’s drawing firstly because it is a beautifully crafted artwork with a complex and sophisticated composition that takes cues from pivotal modern episodes like Russian Constructivism, the Bauhaus, and Dada collage. And although his formal decisions are inflected by traditions that grew out from these movements, they resonate with contemporary sensibilities – the impact of the built, urban environment on the psychological space of people who live and work in urban centers. Secondly, the acquisition will complement the High’s growing number of drawings by artists of color who live and work in Atlanta." Rooks is Wieland Family Curator of Modern and Contemporary Art at the High Museum. Eric Mack talks about art as if he is ready to “bust a move,” go somewhere, do something; like his art work, he is filled with energy. 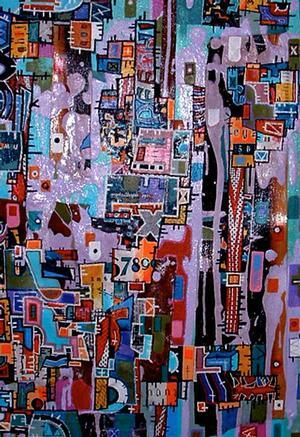 His super charged painting is the result of a steady evolution that began in college when he developed a distillation of the AfriCOBRA style. Then he experimented with a style inspired by the sampling and splicing of DJ culture, the patterns of computer mother boards and the topography of cities — all rhythmically built up from a grid. That intermediate stage led to his current style that departs, in varying degrees, from the grid and appears to draw from European modernist styles such as Constructivist Abstraction and Bauhaus design. Those works are reproduced at the end of this article. While the evolved style borrows and samples, it is distinctively his own. Their father, an electrical engineer, and mother, owner of three hair salons, actively encouraged the children’s intellectual and cultural development. Every summer their mother bought packages of educational materials to reinforce and extend what they’d learned during the year. Their minds would not go idle. Mack also recalls the Make and Do book in the Childcraft encyclopedia series: “I believe I completed every project in this book four times!” "Making and doing" would define the rest of his life. When Eric was 10, breakdancing exploded onto the scene. Fascinated by the physicality of the dance style, he drew its moves and, being entrepreneurial like his mom, sold the drawings to his fifth grade classmates. In 1994, when Mack was an illustration major at Atlanta College of Art, his professor Charles Nelson introduced him to African American painters. Mack was drawn to the paintings of Jeff Donaldson’s paintings and Wadsworth Jarrell. 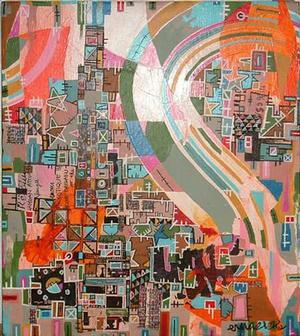 Both were members of AfriCOBRA (African Commune of Bad Relevant Artists), an organization Donaldson founded. One of their objectives was to show that protest art could be fine art. 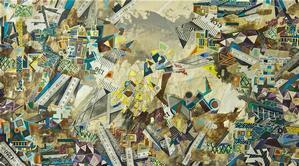 Mack was drawn to how Donaldson took the figurative form and deconstructed elements to form abstract shapes. The style was called transAfrican. It was characterized by a high energy use of color with rhythmic linear effects, and flat patterning that created a form-filled composition with a picture plane that was compartmentalized. Jarrell’s work was more kinetic with circles and dots and zig zag shapes covering and bouncing off of an African figurative image. The AfriCOBRA influence led to Mack exploring the use of intense colors in his own work and pushing through the figurative image into energized, abstract shapes. 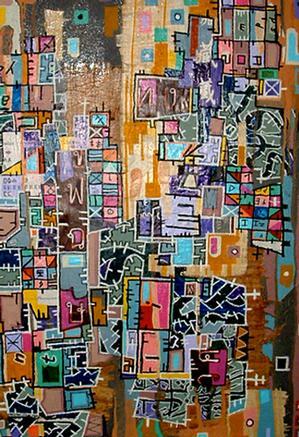 Mack graduated from ACA in 1998 and had his first solo show at Gallery Domo in Atlanta Georgia in 1999. Predominately figurative and based upon the shapes within various African masks – a nod to AfriCOBRA – the drawings and paintings in the show sold, but this would be the last time that the figurative element would be the main subject in Mack’s work. Mack’s good friend at ACA, Angelbert Metoyer from Houston, Texas, in many ways was ahead of his fellow students. Metoyer had already begun his career and was generous in sharing his business experience with Mack. In 2000 the two shared a work space and began to collaborate on a series of works that were intended to go into an exhibition that has yet to be realized. Over the next three to four years, when Metoyer visited Atlanta or Mack traveled to Houston, they visited one another’s studio and worked on a series of collaborative paintings. By this time Mack’s work was becoming more abstract. He had stopped drawing and was printing out black and white Xerox copies of objects which he used as the foundation for his paintings. Borrowing from the fundamental process of Cubist collage, Mack used the black and white copies as a method for holding on to the object while deconstructing the pictorial elements of the figure. 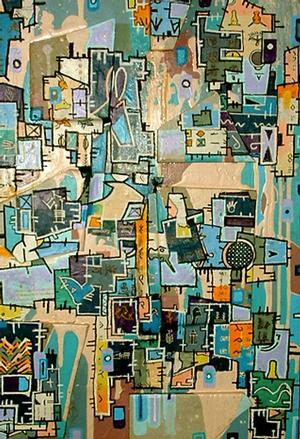 Stemming from a studiously primitive sensibility, Metoyer’s imagery leans towards a fantastical lyrical expressionistic style that’s figurative in the sense that he does not let go of the object. Together they executed between 10 to 12 paintings that are 24 x 36 and 30 x 30.” Mack says if the exhibition ever takes place, it will be titled, Afro-Electro. Despite the lack of exposure for the work, the experience proved to be defining for Mack. Through the collaboration Mack discovered a sense of freedom in painting and liked that sensation. The year 2000 was a transitional period for Mack. 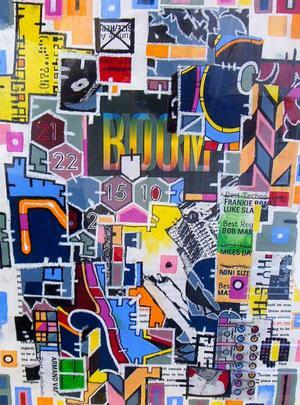 Not only did his work become more abstract, he was gaining recognition with a steady schedule of exhibitions. In 2001 he showed at the Youngblood Gallery and he received his first review by noted critic Jerry Cullum in the Atlanta-Journal Constitution. 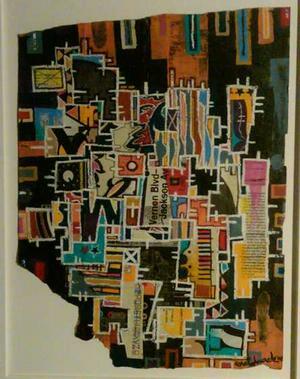 That same year, the New Power Generation exhibition juried by Danny Simmons was held at the Hampton University Museum. 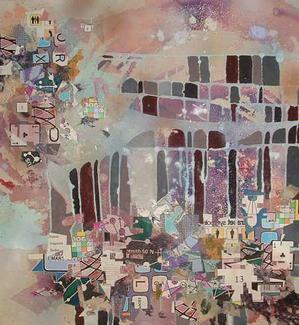 Simmons went on to develop an exhibition at the Rush Art Gallery in New York based on the Hampton show. For that exhibit he selected several artists from the previous show, including Mack. In 2003, Mack met noted curator and critic Franklin Sirmans who was visiting Atlanta to make artist studio visits in preparation for the Atlanta Contemporary Art Center’s Biennial which he was curating. Sirmans was also reviewing the Simmons exhibition for Sculpture Magazine and recognized Mack’s work in the article. That same year Mack was invited to become part of the Fay Gold Gallery’s stable that included such artists as the late Robert Mapplethorpe. He remained with the gallery for five years. In 2004 Rashida Brumbray, then a curator at The Studio Museum in Harlem, invited Mack to participate in a group exhibition, MX80. Two years later Brumbray was in touch with Mack again, this time for her “Check Out” column in the spring 2006 issue the Museum’s Studio magazine.The concept of the column was, “if you like the work of Jeff Donaldson then check out the work of Eric Mack.” One could see that Mack had both dissected and embraced enough of Donaldson’s visual elements to reflect Donaldson’s sensibility within his own work. In 2009 Mack grew restless. He was ready to travel. His girl friend and an avid collector of his work were in Germany. “I chose to move to Germany because I really felt uninspired and a bit frustrated,” he recalls. “I needed a new perspective.” Mack believed it was necessary to relocate to a place that would take him out of his comfort zone. Seven months after moving to Germany, Mack learned of a five-year atelier award from the Bureau of Cultural Affairs for the City of Munich. He went to the bureau and asked to meet with Diana Ebster, who oversaw the program. Thinking Mack was someone she knew (apparently the name Mack can be recognized as a German surname), Ebster came out to the lobby to meet him and, learning he was an American artist, invited him into her office. He showed her his most recent slides and discussed his education and professional experience. Apparently his approach to applying for the award was unheard of in Germany; most German artists are more reserved. About 900 artists applied for this stipend which could only be awarded to 40 artists. So Epster wished him well but could not promise that he would be selected. However Mack was one of the 40 successful applicants. From that point on Mack’s aggressive approach was dubbed “an American style.” The award gave him a work space and enough money for him to live and travel throughout Europe. During this period, Mack began to work on 6-foot canvases. Between the years 2009 and 2013 Mack visited most of the Munich museums and galleries and, in addition to connecting with curators, writers, and photographers, met design team of Vöekl Snowboards. Mack had never done snowboarding but as a teenager he had been a skateboarder. Making a pitch to design their boards, he told the design team how at age 13 he had drawn plans for the skateboard ramps and, with the help of his father, built a half pipe with PVC coping, a quarter pipe, and a launch ramp in his family’s large backyard. Many of the local "Sk8 rats" came there to ride. He told them, “The favorite of my three boards was my clear, natural wood stain street model, Vision Jinx." I rode on black, O.J. II wheels, with Swiss bearings mounted on freestyle independent trucks.” It was clear to the Germans that Mack new what he was talking about and he was given a contract to design images for the skate boards. The Mack-designed boards will be showcased sometime this year. Mack’s German friends included Christian Kaufmann, lead photographer for the FC Bayem Soccer team in Munich. Together with Kaufmann and PhaseOne Camera Systems, Mack completed a video workshop. He also spent time at the KunstAkademie studios in Munich with friends participating in a painting program. In discussing his work Mack has pointed to the influence of several schools and styles such as Bauhaus, Dada and Constructivist Abstraction and let’s not forget his early embrace of the transAfrican style of AfriCOBRA; all of these elements are reflected in his work. In Mack’s 1998 rooster study, we can see the beginnings of his need to explode his work outside of the two dimensions of the frame. Even, or especially, because the work is black and white, one can see the high powered energy that is destined to push out of the frame. One might say that there is color in this black and white graphite work. It certainly foreshadows the next phase in his paintings which was to free his art from the object through the process of the deconstruction that he found in the transAfrican style. 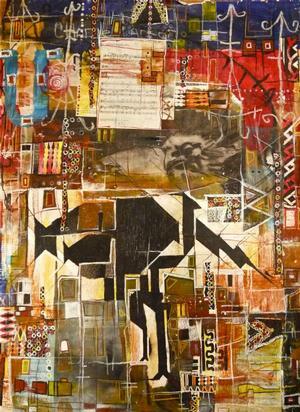 The transAfrican style of AfriCOBRA with its intense shades of color and free rhythmic shapes and patterns enabled Mack to move out of and deconstruct the object. However, one can also see in these early works a reluctance to completely give up the object so, borrowing from the Cubists, he begins to use black and white, photocopy images as part of his work creating his mixed media collage paintings. Mack references the Dadaist influence in his work. There’s a sense of the idiosyncratic and childlike playfulness in his work which is not exactly the intent of Dadaism but given that the word, “dada,” comes from the French meaning hobbyhorse, it works for Mack. This freedom of deconstructing the original nihilistic intent of Dada while holding on its pictorial elements enables Mack to play with the irrational and arbitrary forms that he brings into his work. In Bauhaus, Mack found yet another tool for maintaining objective elements that allow for the perpetuation of his need for speed. The Bauhaus School approach to design combined fine art and handicraft principles and practices. Despite the busyness of his patterns, Mack is drawn to the simplicity of forms, rationality, functionality and the idea (as seen in his snowboard design work) that mass production can live in harmony with the artistic spirit of individuality. 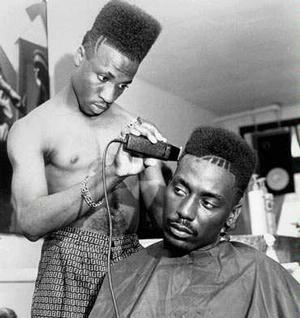 And his pragmatic experience as barber who designed and shaped hair into sculptural forms was a good foundation for his development of constructivist approaches to art. 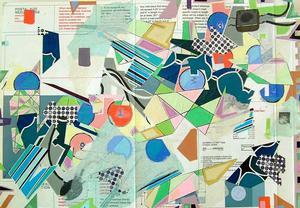 All of these influences play into paintings such as SPFC-9 (2013). In SRFC-1991, we can see that he has reintroduced the object in the form of rulers and numbers; his illustrations live through the controlled chaos within his world of Constructive Abstraction. 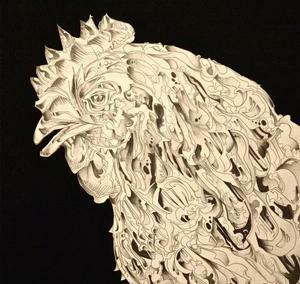 Remember the twists and turns of the feathers of his rooster study? That movement has intensified in this painting as his cityscape is both imploding and exploding at the same time. 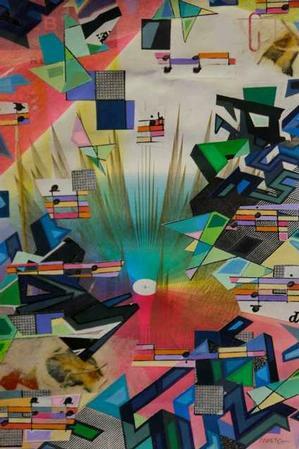 Shards of color bounce and shift in space in the same manner Mack must have experienced when he rode his skateboard. As with the previously-cited movements, Mack, of course, is not focused on the politics of Constructivist Abstraction (which arose out Russian artists’ affirmation of utilitarian, anti-elitist principles of communism), nor is he extolling the “machine” as the source of universal progress. Rather he is looking at the movement’s characteristics of assemblage and exploring the possibilities of creating a painting that can also be sculpture. And maybe like Friedensreich Hundertwasser, he also is moving towards looking at the three-dimensional possibilities of painting as architecture. Mack spent a lot of time in Europe looking at architecture. The ideology of Constructivists is that the three dimensional structure is important because of its design and functional implications. For Hundertwasser whose work transitioned from commercial to fine art to architecture to finally in his Hundertwasser’s apartment block in Vienna, the culmination of Constructivist ideology in the sense that he merged fine art with functional art and nature. Starting in July 2014, Eric Mack will have an opportunity to work without distraction at the Hambridge Artist Residency for the Arts and Sciences. He will be an exciting artist to watch as he speeds and winds through his paintings, blasting off into the unknown as he reimagines the material world to reflect the unity of the arts through his energetic vision. Gylbert Garvin Coker, Ph.D., is an art historian who lives in Thomasville, GA. She is the author of Dona Honoria Cummings Clarke (who was one of the wealthiest women in 18th century St. Augustine, FL, 1748-1804), 2012; and Nearest and Dearest, the descendants of Thomas and Honoria Clarke, Book 2, 2014. *Mack’s younger sister, Jennifer, went to Morris Brown College in Atlanta. From there she went on to Tuft University in Boston, and then transferred to Pratt Institute in Brooklyn, New York where she studied to be a printmaker. Jennifer Mack now teaches at the Harlem Children’s Zone. In 2005 she received the Elizabeth Catlett Printmaking Award and during summer 2014 will be traveling to Japan to present a paper at the University of Tokyo for the International Moku Hanga Printmaking Conference and in June 2014 she will be exhibiting three of her prints at the Newark Museum’s exhibition, Ready or Not. Michael Mack’s younger brother, majored in production design at Savannah College of Art and Design. He later went to Italy where he studied shoe design and completed a master’s program at Polymoda in Florence. He worked with Salvatore Ferragamo for a time and then for two years he worked in China as head designer for a Brooklyn-based shoe company. Michael Mack now lives in Brooklyn, works with Roberto Cavalli, and has his own boot company, the Michael Grey Line.